Straight and tall spike-shaped fluffy flowers that start blooming from the top downward (usually it is the other way around in Nature). So, to keep a fresh look you can easily snip off the top faded part of the flowers as they continue to bloom. Very easy to grow and excellent for attracting birds (enjoying ripening seeds in fall) and butterflies (loving the nectar) to your garden. The leaves are dark green and needle-shaped on strong sturdy stems. 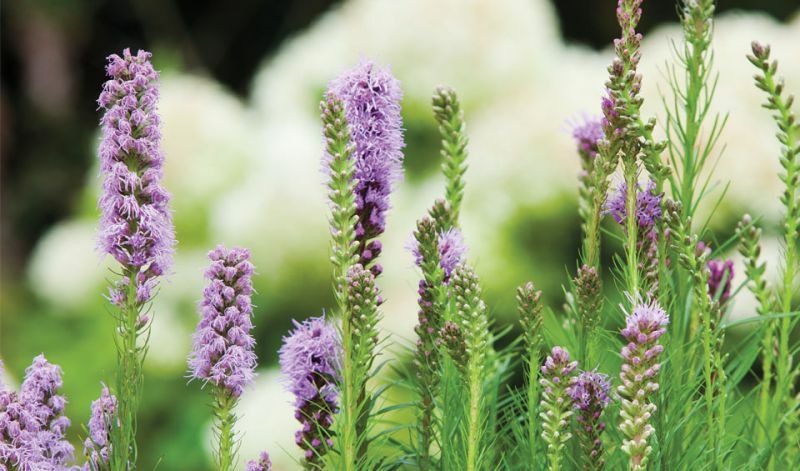 Once established Liatris are drought resistant and very popular as a cutflower. In borders, beds, perennial gardens, mixed containers and as cutflowers. Species only. The white-flowering species on the market is called: floristan 'Alba'. Native to eastern & central North America, Mexico and the Bahamas.